More Chicago baseball beers. I kind of forgot about this beer, but Goose Island came out with a beer when the Cubs officially “broke the curse”. If you know anything about the curse of the Billy Goat – it wasn’t exorcised when the Cubs won the World Series. That happened when the team made it to the Series. This beer came out at that point – when the Cubs were playing the Indians. The brewery has been 100% owned by Anheuser-Busch InBev since 2011. 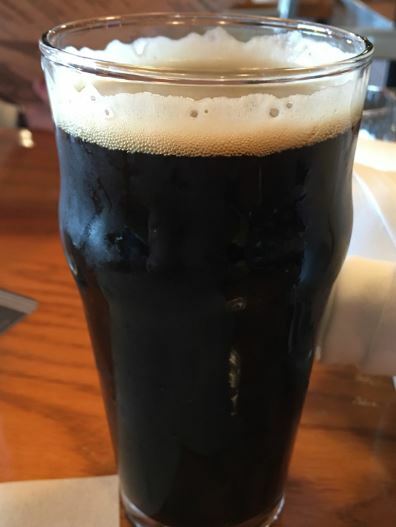 Description: This stout was brewed at the brewpub on Clybourn, which is actually closed right now. It’s described as having an onyx color, pine and coffee aroma, chocolate and hop resin flavor, toasty finish. From what I remember, that’s about right. My wife and I brought the kids down to Wrigley on the Saturday morning before game 4 to get some nice pictures. We hit the brewpub up for lunch, and I tried this beer. Medium: This was only available on draft at the Clybourn brewpub. How it’s related to baseball: It’s brewed in honor of the Cubs ending the “Curse of the Billy Goat” when they beat the Dodgers to make the club’s first World Series in 72 years. It’s also a reference to celebrity fan Billy Murray, who was one of the stars of Ghostbusters. Chicago seems to have a lot of baseball specific beers. I think it’s that Chicago just has a ton of breweries and in the craft beer desire to find as many different themes and logos as you can, you’re bound to have some baseball overlap. There aren’t nearly as many football beers, though. Hop Butcher is a pretty small craft brewer. They don’t even have their own brewery (yet) – they contract brew out of a local place. Unlike some beers you might expect to find at the ballpark, this one isn’t brewed with corn to be a golden color and filter right through you. This is a nice, solid, roasty, malty batch of goodness! Hop Butcher for the World is formerly known as South Loop Brewing; they changed their name about a year ago to have an even cooler Chicago-related brewery name. This one pays homage to the poem by Carl Sandburg from the early 1900’s (“Hog Butcher of the World). Medium: When they were South Loop brewing, I think it was available in 22-ounce “bombers”. Now they release them in 16-oz cans which I think is a better medium. I got a 4-pack this summer and just finished my last one. 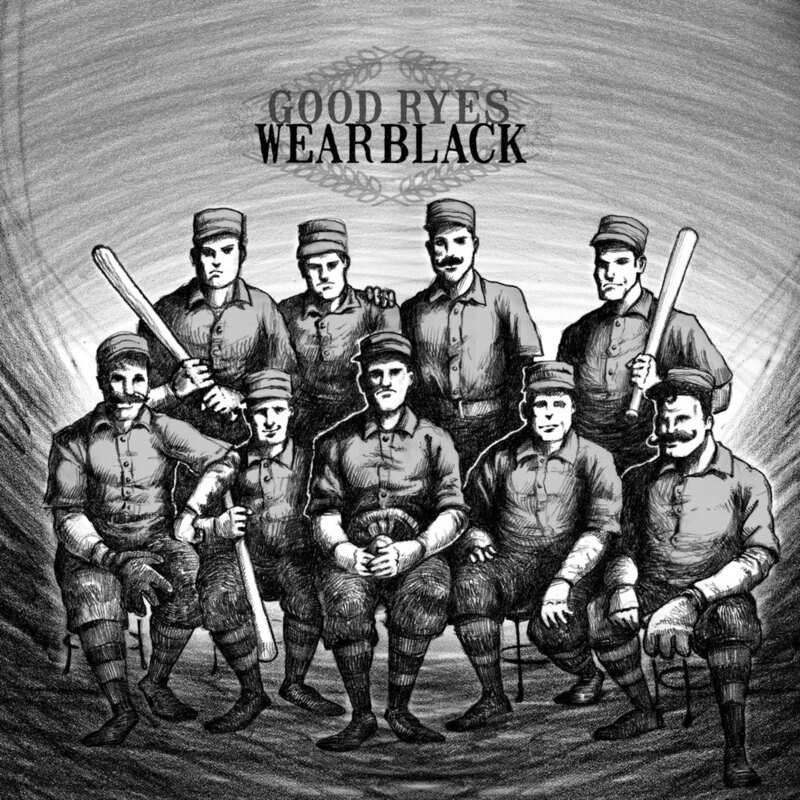 How it’s related to baseball: It’s sold at U.S. Cellular Field and has a bunch of old-school baseball players on the logo. I’m a Reds fan whose kids root for the Cubs, but I appreciate some South-siders staying true to their team! Almost 6 years later – this is post #1700 for me. I used to do something sepcial for these posts, but now only do it every 500 or so. But I try to point them out if I remember! Living in Chicago, there was a bunch of celebration surrounding the first win in 100 years. There were a lot of beers made in that celebration. Pipeworks, the relatively young craft brewery that has become incredibly popular around these part, joined in. 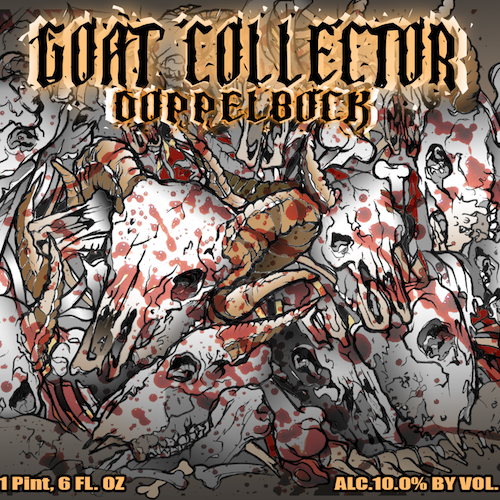 Description: “Goat collector doppelbock is getting brewed this Saturday! We’re taking tomorrow off to go to the Cubs parade! !” This beer is quite different from the standard beer I’ll do for one of these baseball + beer posts. It’s a doppelbock, which is a double version of a bock beer. Which means it’s malty and dark, not hoppy whatsoever. It’s not a beer you drink at a baseball game. But it is a beer you can drink in revelry after 108 years of no titles! I had it; it’s a very nice doppel. Was a good beer I shared with my wife over dinner. Medium: This beer was available in 22-ounce “bombers” throughout Chicago. You could also find in on tap at certain locations. I got the bomber. How it’s related to baseball: It’s a beer brewed in honor of the Cubs winning the World Series. And breaking the curse of the billy-goat. 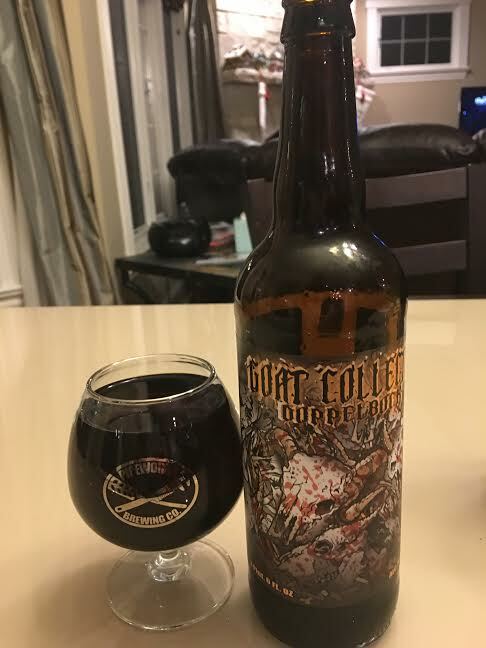 It has goat skulls on the label. For my next “Saturday Suds”, I went with another Cubs celebration beer. And another Goose Island beer. Description: “Bubbly! A champagne inspired beer to celebrate a World Championship! 108 years in the making.” It’s a Belgian Strong Golden Ale. I get the champagne comparison, but there’s also a lot of Belgian yeast in there that gives it a unique taste. It was definitely good, though. Medium: This beer was only available on tap at the Goose Island taproom on Fulton Street a little west of downtown Chicago. I had it during a trip Brewpub, which is how I drank it. 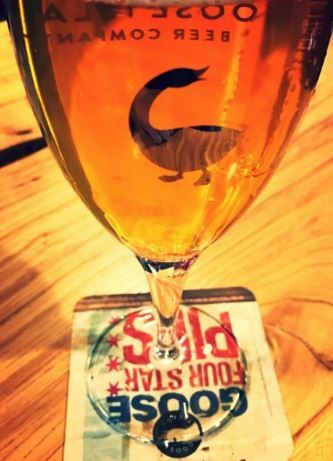 You can’t buy it in stores, and it’s not even at Goose Island’s other brewpub in Clybourn. It’s no longer mentioned anywhere on their website – I think they had it on tap for a little less than a month after the Cubs won the World Series. 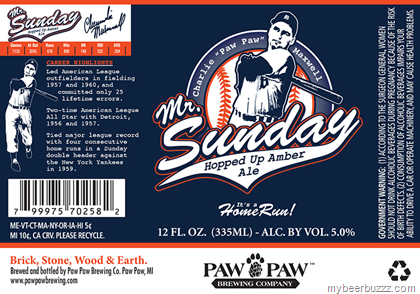 How it’s related to baseball: It’s a beer brewed in honor of the Cubs winning the World Series. I did a bunch of posts about all the beers I’d had from Cooperstown Brewing Company – but I did get one more baseball related beer on my summer trip to baseball’s hallowed grounds. 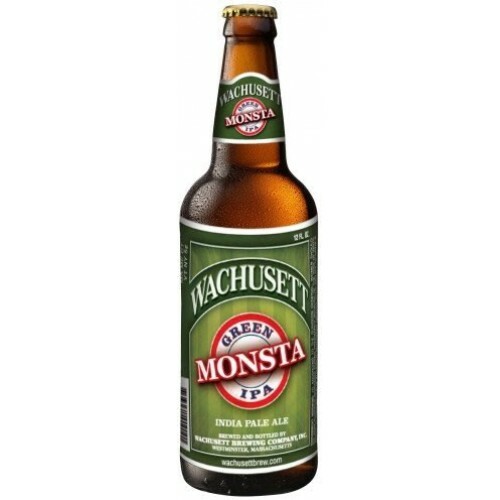 When in Western Massachusetts, I found this beer at a store and, given my posts like this, obviously had to pick it up! It pours a copper color and is a traditional IPA with hoppy bitterness. Medium: I had it from a 12 oz bottle, but I’ve seen cans and you can find it on tap around Massachusetts. It’s not a seasonal brew or anything – it’s always available. How it’s related to baseball: The brewery is obviously playing off the large green wall in left field of the ballpark on Yawkey Way. And playing off the Boston accent. Kudos! I’m fresh of watching the Big Ten championship game – what a finish! But it can’t top the finish of the World Series. As a Chicago resident, I got to enjoy that win, even though the Cubs aren’t my team. It’s a solid IPA. Not my favorite because I’ve got to where I prefer less malt. But it’s enjoyable – hoppy, but not as hoppy as some – with a nice malt backbone. Medium: You can find this beer all over the place in markets where Lagunitas distributes. But not the W flag version :). It only comes in a 12 oz bottle. 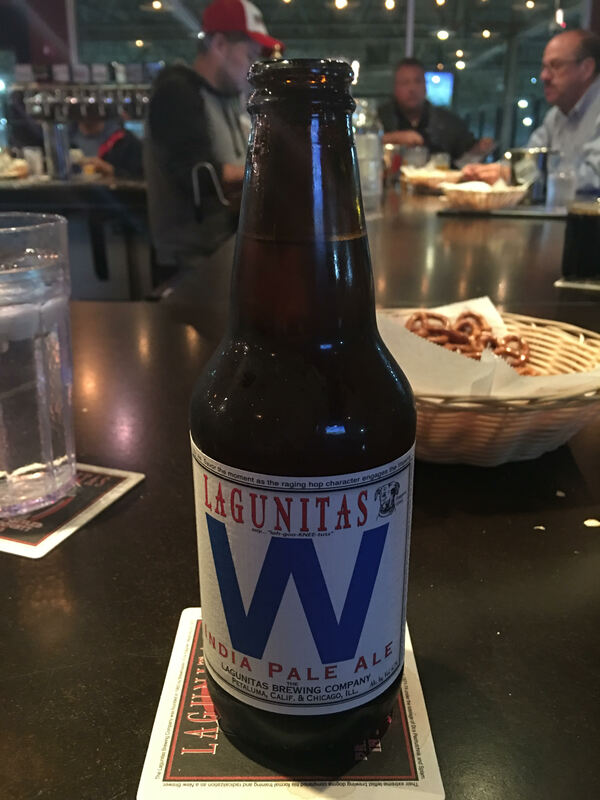 How it’s related to baseball: When the Cubs won the World Series, Lagunitas produced a bunch of bottles with the famous “W” flag on the label. The “W” is the flag that all the Cubs fans out here fly in honor of a Cubbie win. If you went to the brewery the week after game 7 – as I did – the Lagunitas IPA bottles you’d have were the ones you got. It’s funny, I just had one, snapped the picture above and went home (after about 4 other beers). The bartender asked me if I wanted to keep the beer, and I wish I had. What I didn’t realize was that the bottle was going to become a collector’s item. I figured a boat load would hit distribution shortly thereafter. That wasn’t the case. Lagunitas sent some out in distribution, but as surprise wins if you bought a 6 pack. From what I’ve heard, the Cubs put the kibosh on this since there isn’t any kind of license agreement. Wish I’d have kept the bottle, they are going for about 20 bucks on eBay, and since my son has become a die-hard Cubs fan i’m sure he’d appreciate it in 17 years when he’s of age!